I’m back after spending most of the month of May teaching in Ireland. What an incredible experience! My students, who came from several Tennessee colleges, were some of the most creative students I’ve ever worked with. Ireland is a land of castles, sheep grazing in green pastures, Irish dancing, cliffs, the Aran Islands where people still speak the Irish language – I could go on. The weather was not as perfect as everything else – too cold and rainy for my liking – but Ireland is truly a magical place and the Irish are warm and welcoming. Yes, I’m glad to be home, but I’m so glad I had the experience! This entry was posted in Just Writing About . . .. Bookmark the permalink. 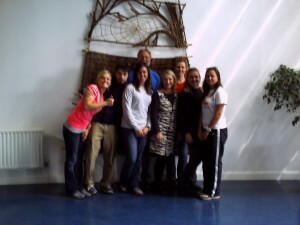 Phyllis is a great teacher and I enjoyed her class in Ireland. I wish it had been longer, I could have learned so much more. It was good to have a class taught by someone who actually knows what she is talking about. The class was successful because of the high level of student participation and the great quality of student writing. It all seems a little like a dream now, doesn’t it! We were there 3 weeks – 44 student, 4 adults. I taught creative writing and had a wonderful group. Though we put in our 37.5 class hours, we also spent a lot of time seeing the sites – Kilkenny Castle, Cliffs of Moher, Aran Islands, Rock of Cashel – and just being immersed in the culture of the small town, Thurles, where the people were so warm and welcoming. If I were more skilled, I’d put up some photos. Maybe I’ll try anyway!